Sometimes You Just Need a Laugh | Half Heart. Whole Life. Hey fellow heart parents! Listen, we all know that life is tough with juggling our heart warriors’ needs, work, play, school, etc. So this post isn’t meant at all to focus on those things…in fact, today’s post is to help us all remember to take a step back and smile and laugh a little bit in spite of some of the challenges in our life. So let’s take a minute and think about the first time people (whether family, friends, or strangers) met your heart baby. You know people are well-meaning but at times their responses are….well…a little interesting. With that in mind I took the time to create something that I hope will make heart parents laugh just a little….behold: Heart….Parent….BINGO! Unless you’re uber-sensitive, I’m hoping this little game at least makes you crack a smile. Now don’t get me wrong, this isn’t meant to offend the well-meaning, friendly people in our lives: God knows they’re trying their best. But come on: we’ve all heard some of this stuff, right? So as you go about your week and you run into people who tell you things like “Oh he’s better now, right?”, instead of sighing, you can think about your BINGO board and check one space off. I’m a big believer that in spite of our difficulties there’s always a bright side. 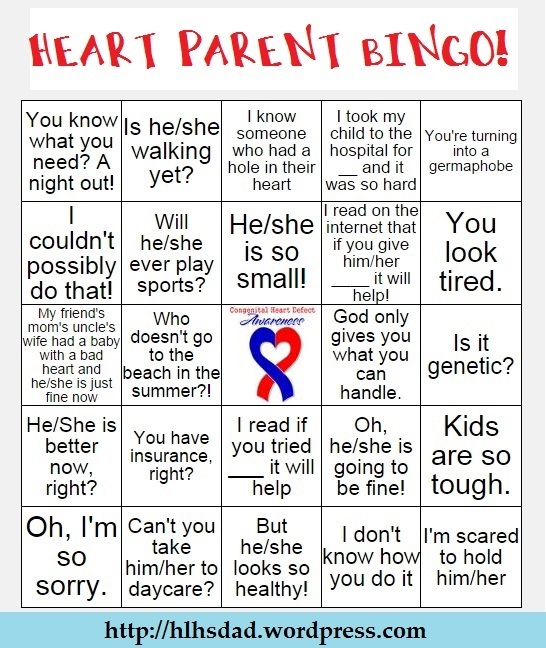 Alright Heart Parents…who will win BINGO first this week? Posted on October 13, 2014, in life and tagged CHD, congenital heart defect, heart parent, Heart Parent Bingo, HLHS, HLHS Dad, hypoplastic left heart syndrome. Bookmark the permalink. 12 Comments. Haha!! I love this so much. Thanks for the laugh and looking on the bright side:). As a tetralogy of fallot parent I have had most of this (all except the beach and daycare). We used to joke that we should get t-shirts made with some of these 🙂 Plus, the standard doctor quote “every child is different”. YES! A shirt would be hilarious…I would also nominate the infamous “Let’s monitor this for now” doctor quote. Thanks for reading! HA. The “hole” one is funny. Thanks for the laugh..
Bingo Bingo Bingo all over the board!! Thanks for the smile Chris! !